Qanat Quartier is the Venice of the Middle East. The extensive canal network and pedestrian-friendly plazas make it the place to visit during the cooler months. The surroundings are colourful with quaint restaurants, cafes and apartments looking out onto the waterways. There is even a Rialto-inspired bridge that is perfect for taking selfies and group pictures! It’s also now easier to visit Qanat Quartier with the new piaggio service hosted by The Pearl-Qatar. The ride does get a little bumpy, but its a convenient and fun way to travel around The Pearl. 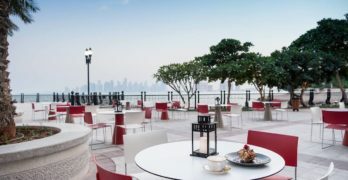 There are plenty of reasons for you to visit Qanat Quartier – here are five delicious ones! One of the hottest cafes in Doha right now where it is all about the milk cakes. They’re available in a variety of flavours including cereal, saffron and rose! Expect the place to be packed out at busy periods but it’s worth a visit for the upstairs floor. Head upstairs and you will find floor-to-ceiling bookcases with books on almost every subject under the sun. Great spot for a leisurely catch up with friends. Opening Times: Saturday-Wednesday 4:00pm – 11:00pm; Friday 4:00pm – 12:00am. There is a jungle vibe at Evergreens that gets us every time – every peaceful corner encourages us to stay longer. But what we really look forward to are their chocolate desserts. It’s hard to choose between the raw Chocolate Torte or the Chocolate Addiction pudding. Both contain raw cacao which is good for you so its a win-win situation really! Opening Times: Daily 7:00am – 10:00pm ( Fridays close at 11:00am and reopens at 12:30pm for prayer break). Contact Phone Number: +974 4472 0437. There is something special about the unique desserts made at Chimney cakes . There’s some debate over the origins of the chimney cake but it’s a popular Hungarian sweet snack thats barbecued! A long strip of sweet pastry is wrapped around a wooden mould and cooked in a special oven. You can order savoury chimney cakes with zaatar or cheese & garlic, but the sweet options are the best with ingredients like pistachio, nutella, cinnamon, and almonds. Think dessert-shawarma – it’s beautifully crisp on the outside, while staying soft in the middle. Contact Phone Number: +974 4444 7003. The name gives it all away at this crepe restaurant which serves savoury and sweet traditional crepes, and crepe bites. Savoury flavours include Greek, Italian and Mediterranean, but the dessert we like the best is the sweet Choco Extreme. A thin crepe that’s stuffed with molten nutella and decadently rich chocolate – perfection! Opening Times: Sunday-Wednesday 9:00am – 10:00pm; Thursday – Saturday 9:00am – 11:00pm. Contact Phone Number: +974 5000 2612. There are some interesting pretzel offerings at Pretzelmaker including the pretzel bites, pretzel pizza and pretzel hotdog. For desserts there is the iconic looped Cinnamon Pretzel – a deliciously soft crave worthy snack. Save room for seconds! Opening Times: Daily 10:00am – 11:00pm.